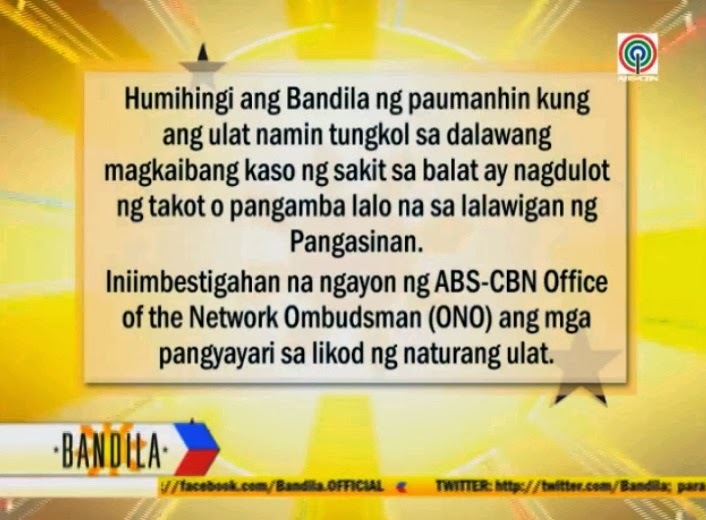 As it continues to face withering criticism, Bandila has finally come forward and apologized on Thursday "for the unintended fear and panic caused by its report on the cases of skin diseases in two towns in Pangasinan." In a statement, ABS-CBN said that its own "Office of the Network Ombudsman is currently investigating the circumstances that led to the airing of the report," and that they "will take the appropriate actions based on the findings of the Network Ombudsman." The ABS-CBN late-night newscast aired a report on Monday on two alleged cases of a flesh-eating disease in the province of Pangasinan. The report, which relied on anecdotal evidences, was dispelled as a hoax by health officials on Tuesday. "Bandila" apologizes for the unintended fear and panic caused by its report on the cases of skin diseases in two towns in Pangasinan. In accordance with internal standard procedures, ABS-CBN's Office of the Network Ombudsman is currently investigating the circumstances that led to the airing of the report. ABS-CBN News will take the appropriate actions based on the findings of the Network Ombudsman.